Home / Online Deals / Black Friday Deals 2018 / Cyber Monday Bearpaw® Boots Deals! As low as $34.99! 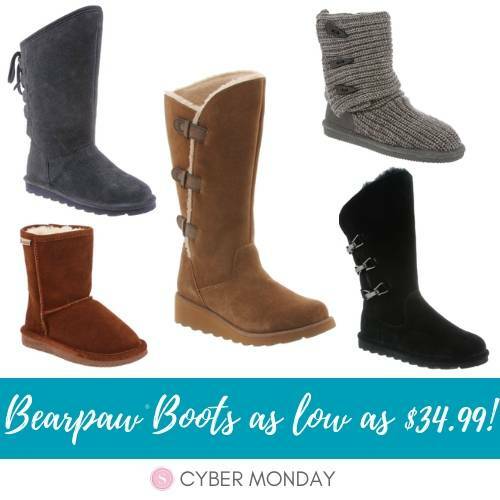 Cyber Monday Bearpaw® Boots Deals! As low as $34.99! Best Black Friday Bearpaw Boots Deals & Cyber Monday Sales 2018! Get the cheapest prices on tall and short Bearpaw Boots! If you are looking for some cozy boots for fall and winter, I have all of the Best Black Friday Bearpaw Boots Deals & Cyber Monday Sales for 2018 here! I will update this list with any more awesome deals that come up! You may also want to check out our Best Black Friday Ugg Deals & Cyber Monday Sales! Zulily has an AMAZING sale today on Bearpaw Boots for men, women, and kids! Sizes and styles are already selling out early, so do not wait to buy yours! There are no Zulily Coupon Codes needed, and you aren’t a member of Zulily, be sure to sign up here. These Hickory Emma Suede Girls’ Boots are down to only $34.99! There are quite a few other styles that lower in price at checkout! I LOVE these Black Jenna Suede Boots for women which will be only $64.99 today! The Bearpaw Knit Boots are also just $49.99, and I got these for myself two years ago! I LOVE THEM! I am actually wearing them right now :) See all the deals in the Zulily Bearpaw Boots Sale and grab your sizes before they are gone-Zulily sales go fast! 6pm.com has lots of awesome prices on Bearpaw Boots! They have Free Shipping on orders of $50 or more! The Emma Tall Boots are marked down to only $49.99 which is an awesome price for the tall ones. The cute Demi Short Boots are on sale for $44.99 and they come in several colors at that price. See all of the great Deals on Bearpaw Boots! BEARPAW and all BEARPAW logos are trademarks of Romeo & Juliette, Inc.
AncestryDNA: Genetic & Ethnic Testing Kit just $49! Cyber Monday Hatchimals® Deals! Mystery Egg Box only $29.99 Shipped!